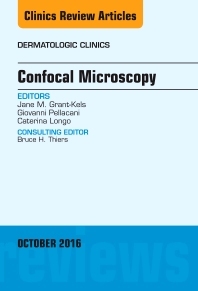 This issue of Dermatologic Clinics, guest edited by Jane M. Grant-Kels, Giovanni Pellacani, and Caterina Longo, is devoted to Confocal Microscopy. Articles in this timely issue include: Basics of Confocal Microscopy and the Complexity of Diagnosing Skin Tumors: New Imaging Tools in Clinical Practice, Diagnostic Workflows, Cost-estimate and New Trends; Opening a Window Into Living Tissue: Histopathologic Features of Confocal Microscopic Findings in Skin Tumors; Addressing the Issue of Discriminating Nevi from Early Melanomas: Dues and Pitfalls; Melanoma Types and Melanoma Progression: The Different Faces; Lentigo Maligna, Macules of the Face and Lesions on Sun-damaged Skin: Confocal makes the Difference; Glowing in the dark: use of confocal microscopy in dark pigmented lesions; Enlightening the Pink: Use of Confocal Microscopy in Pink Lesions; Shining into the White: The Spectrum of Epithelial Tumors from Actinic Keratosis to SCC; Application of Wide-probe and Handy-probe for Skin Cancer Diagnosis: Pros and Cons; Confocal Microscopy for Special Sites and Special Uses; Confocal Algorithms for Inflammatory Skin Diseases and Hair Diseases; In Vivo and Ex Vivo Confocal Microscopy for Dermatologic and Mohs’ Surgeons; Telediagnosis with Confocal Microscopy: A Reality or a Dream? ; “Well-aging": Early Detection of Skin Aging Signs; The Role of Confocal Microscopy in Clinical Trials for Treatment Monitoring; and Fluorescence (multiwave) Confocal Microscopy. Caterina Longo is Associate Professor at the University of Modena and Reggio Emilia, Italy. Although providing the best care possible for patients remains her primary goal, she also committed to education and clinical research. She is actively involved in clinical research and she has published numerous papers on topics related to skin cancer with an emphasis on melanoma, atypical nevi, Spitz/Reed nevi and non-melanoma skin cancer. Her research interests are focused on the use of imaging instruments such as dermoscopy, and confocal laser microscopy to recognize skin cancer early in its development. She pioneered the use of ex vivo fluorescence confocal microscopy for micrographic Mohs surgery applied for basal cell carcinoma and other visceral tumors. She frequently lectures on these topics both nationally and internationally being the second Author publishing on this topic (source Scopus, December 2016) for a total of 250 papers (H-Index 28; citations 2702).